The Tampa Bay Rebels came up just short in their bid to repeat as Florida Basketball Association champions when the Rebels game-tying attempt bounced off the rim as time expired, giving the Heartland Prowl a 111-109 victory and the league championship in front of the largest crowd of the season at Freedom High School in New Tampa. The Rebels and Prowl, which have built an exciting and intense rivalry over the past two years, both had chances to put the other team away during the course of the game, but neither team could capitalize, leading to another exciting finish. Over the course of 5 meetings during 2013, including the championship game, the Prowl narrowly outscored the Rebels 557-555 in total points scored. Tampa Bay jumped out to an early 17-5 lead, taking advantage of the Prowls zone defense in the early going. The Prowl, however, began limiting easy buckets for the Rebels as they switched to a man to man defense, and made the most of several second-chance scoring opportunities on the offensive lead to grab the lead in the second period. Behind strong 3-point shooting, the Prowl outscored the Rebels 11-6 to over the last 3 minutes of the first half to build a 53-44 halftime lead. Coming out of the half, the Rebels made an early run, powered by 8 straight points from Chris Stephenson (6'3''-G, college: NC-Asheville) as he began to assert himself in the second half. After gaining momentum from Stephenson's fast start, Tampa Bay cut the deficit to single digits on an Aubrey West (6'2''-G) layup late in the third quarter. The Prowl, however, finished the third on a run of their own, leading by as many as 17 before finishing the quarter with a 91-76 lead. Tampa Bay got back on track in the final quarter with a strong defensive effort and solid execution on offense. A strong 14-3 run by the Rebels closed the gap to 94-90 halfway through the fourth. While the Prowl countered with a three-pointer, Rebels forward Stan Bufford (6'4''-G-84, college: W.Michigan) hit back to back three-pointers of his own to bring the home team to within 1 point with just over 5 minutes left in the game. Both teams battled over the next four-plus minutes, staying within just a few points of each other. Trailing 109-106, Aubrey West knocked down a three from the corner to tie the game heading down the stretch. With 28 seconds left on the clock, the Prowl began their final possession. The Rebels played solid defense throughout the possession, but gave up a dunk as the shot clock was about to expire. With 3.1 seconds left, the Rebels ran a sideline inbounds play that saw Stan Bufford catch the ball and make a strong move to the basket, but the bank shot bounced off the front of the rim as time expired, with the Rebels suffering only their 3rd loss of the 2013 season. The Rebels were led by Cory Lemons (5'10''-G, college: Cabrini), who had a triple-double with 27 points, 15 assists, and 11 rebounds, while Chris Stephenson finished with 24 points, 6 rebounds, and 4 assists. Stan Bufford added 21 points and 10 rebounds, while Jeremy Grimball (7'0''-C, college: Columbus St.) added 13 points off the bench. 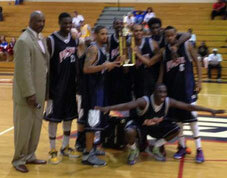 Prowl forward Arnold Louis (6'7''-F-90, college: Savannah St.) was named Finals MVP behind a 27 point performance. Bryce Kachinski (6'1''-G, college: Warner) added 24 points, including 5 three-pointers, for the Prowl as well. Michael Floyd (6'3''-G-86) and Mark St. Fort (6'6''-F) also scored in double figures for the Prowl, who finish 2013 with an overall record of 11-3. To learn more about the Tampa Bay Rebels, please visit www.tampabayrebels.com.